Come visit us! We do Grand Junction's best body piercing! Click here to find out all about Jen and Marshall! Find out how to properly care for your piercings. Click here to print this coupon to our store in Grand Junction, CO! 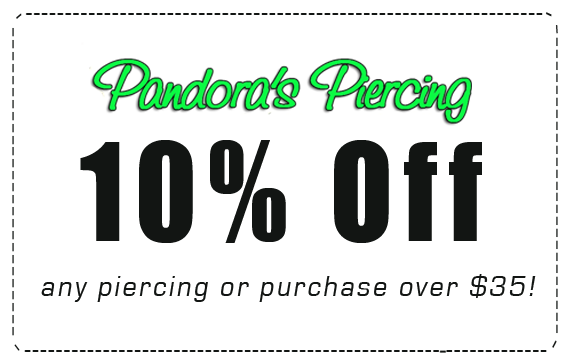 At Pandora's Piercing of Grand Junction, CO, we've got all of your piercing needs covered! Whether it's a body, ear, or genital piercing, our trusted piercing experts will take care of you and get the job done right...the first time! Check out a few of our galleries to see our piercing artists' work. We can promise that with our high quality jewelry, excellent customer service, and sanitized stations, you'll be more than impressed. If you like what you see, give us a call or come on in to get more information. *PRINT our 10% off coupon! Check Out Our Convenient Location. You can find us at 418 Main St., Grand Junction, CO 81501 or call (970) 243-8561!